Is this year's National Day Rally a reflection of pessimistic outlook for Singapore? In this year’s National Day Rally, PM Lee told Singaporeans that everyone should have equal opportunities in the workforce regardless of their academic qualifications. In his presentation, he singled out individuals who had rose through the ranks in the private sector despite their lack of paper qualifications. I doubt non-degree workers can rejoice as the system and values are too entrenched within the society so the very top who have studied hard in their teenage years will scoff at Lee’s attempt to placate the green-eye crowd. Neither should degree holders be too concerned that they were being placed on the same level of non-degree holders. Ostensibly, Lee is trying to show appreciation for the non-degree holders and blue-collar workers who with their hands-on skills and sweat toiled away to help shape the Singapore economy. Most are drawing much lower salaries compared to the management executives. Lee raised the concern of degree gluts that is happening now in Taiwan, South Korea and China but he is careful not to highlight the potential issue of salary expectations. He has probably anticipated that Singapore is going to have difficulties keeping up with the salary expectations of new graduates. 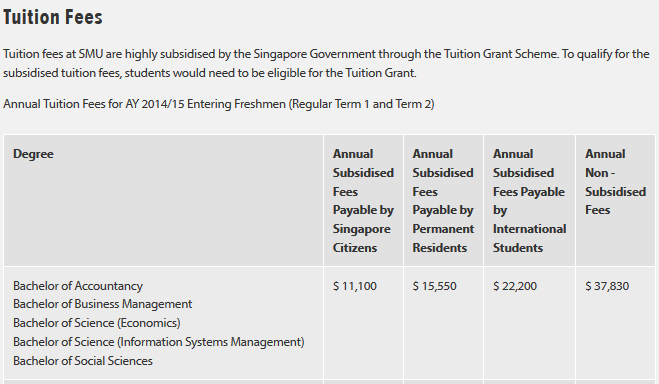 Let’s take a look at the tuition fees for semester 2014/2015 for our three full-time universities: NUS, NTU and SMU. • SMU students are required to pay $11,000 of tuition fee annually. •NTU students are required to pay $7,850 annually. • NUS students are required to pay around ~$8,000 annually. These numbers are inclusive of government subsidies and the amount varies depending on the course but those are base figures. A full-time 4 year course with direct honours would therefore cost a Singaporean between $31,400 and $44,000 depending the institution he or she goes to. This means most Singaporeans have to be burdened with study loans upon graduation and that requires them to secure a good paying job to service these loans. Assuming a SMU grad services $1,000 monthly, a very conservative calculation tells you it takes at least 3.5 years to redeem the loan. With such burdens, our local grads cannot afford to take up $3,000 per month (or less) jobs in SMEs or start-up which are unable to provide good job security or dish out good bonuses. It is more preferable for graduates to join government sector, MNC or financial institutions which have much deeper pockets to satisfy their financial aspirations and allow them to be relieved from the burden of study loans sooner. 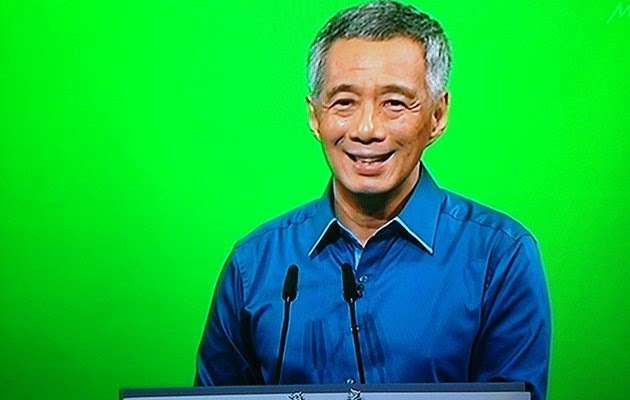 I believe PM Lee is not confident that Singapore will have a sufficient number of good paying jobs waiting for our current undergraduates who are expected to join the work force in a few years' time. With an uncertain global outlook, it is better to make the non-graduates and graduates compete directly against one another now to benefit the economy as much as possible before the recessionary tsunami hits. This article first appeared on Taming The Crowd on 30 August 2014. It is reproduced with permission.